TV programs like Chinese Poetry Conference and Everlasting Classics, China Central Television shows that encourage participants to recite or sing Chinese poems, have received high marks on Chinese media review site Douban. It seems that traditional Chinese culture is becoming increasingly popular among the public. Among all these culture enthusiasts, Tang Bohua, a young director born in 1986, recently caught the attention of lovers of film around the world with his original animated short film The Country of Summer Insects, which was inspired by the wisdom of Zhuangzi, an influential Chinese philosopher who lived around the 4th century BC during the Warring States period (475 BC -221 BC). Screened at the 68th Edinburgh International Film Festival, the 25th Sao Paulo International Short Film Festival and three other film festivals around the world since it was first released in 2013, the film has recently caught the attention of netizens on Chinese social media for its creative approach to introducing the beauty of traditional Chinese culture to the world. "Don't speak of ice to insects that live only one summer…" is a widely known saying in China that means avoid discussing things with inexperienced individuals. The quote is originally from Zhuangzi, an ancient book of philosophy named after its author, and one of the foundational texts of Taoist philosophy. "All my stories are based on this one saying [from Zhuangzi]," Tang told the Global Times on Tuesday. "Most of people around the world have heard of this famous work. It is full of wisdom and a thoughtful treatise written for all of humanity." The philosophy of Zhuangzi is well-known, it was no easy task to portray this wisdom from more than 2,000 years ago as an animated film. Trying to figure out a way to approach the topic, Tang decided to create his own fictional world. The country of Summer Insects [in the film] is near a southern sea. The people who live there only have short lives as they are born in the spring and die in autumn. Among all the records in their historic books, ice is listed as the most precious thing in the world, but nobody knows what ice actually is. Seeking answers, a young general sets out to look for ice. Lacking any dialogue, the entire film sets its story to a dramatic drumbeat and occasionally makes use of a few captions to provide basic background knowledge. "When I read Zhuangzi for the first time, I felt like I was one of the summer insects he was talking about, one that was curious about the universe and what lies outside my life," said Tang. "My goal for the film was to get people to think, just like Zhuangzi did for me." What has really caught many netizens attention is the film's art style, which looks like a traditional Chinese water color painting come to life. According to Tang, the film, which is currently available on Tencent video, wasn't made using traditional animation methods. 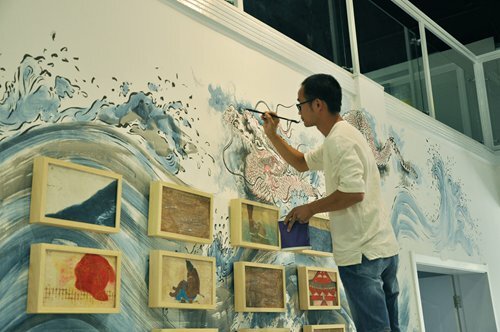 Instead of drawing on paper, Tang cut the images on plasterboard and then made prints, which were scanned into a computer frame by frame. It was no accident that Tang decided to use this visual style for his film. Before the film began production, Tang and his team of 10 traveled to Dunhuang, Northwest China's Gansu Province, looking for inspiration among the Buddhist murals that can be found there. "Dunhuang is a sacred place for me. The artworks there are so powerful and amazing," he said. The team spent months traveling around to many famous historic sites so they could study every detail of the artworks with their own eyes. "We knew we had to get out of the city," Tang said, explaining his thought process when he first began working on the film. "Beijing is too modern now, so it is difficult to find traditional elements." Deeply touched by the murals in Dunhuang, Tang wanted to ensure that his film would live up to them. In order to convey the heavy weight of history that these murals portrayed, Tang chose to use plasterboard for his prints instead of woodcuts, or silk screens. "The hard material of plasterboard is a metaphor for the heavy weight of Chinese traditional culture," Tang explained. Patience was the name of the game during production as it could take up to several days to carve the plasterboard needed for a single frame of animation. The plasterboard needed to be handled very carefully as well, since if anyone of them broke it could have set them back days. In the end, the team produced more than 10,000 plasterboards over a period of more than two years. This painstaking production method stands in sharp contrast to the get-rich-quick ideology that is so prevalent in society today. "I don't mind being slow, so long as I can create something different," said Tang. Considering that the film boasts a high score of 8.5/10 on Douban, it seems that Tang's work has paid off. "For me, this film is perfect," posted netizen Zhang Xianqiang in a review on Douban. "Watching it feels like appreciating a painting."